We are often asked where we come from, and why we trade in old postcards, of all things. We are happy to show you and will present the most important stages of the Bartko-Reher story here. Read and discover where we come from, who we are, and what we stand for. Take your time and get to know us. It all began with an incredible coincidence. It was 1991. Dusan Bartko, a trained power station mechanic, and Ondre Reher, then a trainee high school teacher, met during a visit to a flea market in Halle/Saale. They got talking, discovered their shared passion for old stuff, and decided to go into business together. Although neither of them had any commercial experience or any capital, they decided to start a commercial business. At that time, numerous building supplies stores were set up in what used to be the German Democratic Republic (East Germany). Through acquaintances, they discovered that building materials could be bought extremely cheaply in the former Soviet Union. With great dedication and quite a lot of naivety, they started a wood wholesale business together. On one of their fruitless business trips to the Eastern Bloc, they came across a furniture fittings dealer in Poland. After brief negotiations, the two “wood wholesalers” purchased some of the dealer’s products. They both had the idea of selling the fittings to German chains of building supplies stores. They failed miserably and were left with a ton of brass. 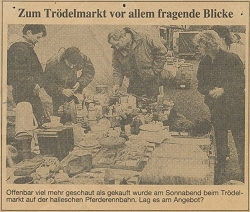 In order to offset their commercial loss, they developed the idea of bringing their “top sellers” to customers directly via a flea market in Halle. But even to the two market novices, trying to sell only furniture fittings in an antiques market seemed unlikely to yield any success. In order to pep up their range, they assembled collector’s items and old bric-a-brac from their personal items – and it worked. They sold all their junk – only the brass fittings failed to attract anyone’s interest. Nevertheless, the two entrepreneurs made their first sales, which amounted to 600 deutschmarks, and thus they had their first successful start-up idea: dealing in collector’s items and bric-a-brac! This was the start of their flea market career. They gained experience, observed which items sold quickly and profitably, and focused on these items. They acquired their stock from estate sales, clear-outs and old teardowns. Very early on, Bartko and Reher also started purchasing sought-after collector’s items from colleagues in the antiques trade who had become their friends. They received their trading license on March 1, 1993, and thus the company Bartko-Reher Antiquitäten GbR was born. They extended their flea market business from Halle/Saale across the whole of Germany. Both of them earned far more from their flea market business than in their jobs. A trainee high school teacher and a power station mechanic became authentic flea market professionals and antiques dealers. Very soon, it became clear that not all items could be sold through antiques markets. Furniture proved to be too cumbersome and many collector’s items too fragile to be constantly packed and unpacked and exposed to bad weather at flea markets. 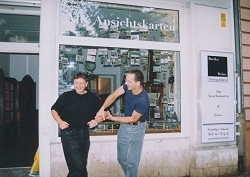 So the two entrepreneurs started renting their first store on Wolfstraße in Halle/Saale in November 1993. Some way outside the town centre, the store proved to be a treasure trove for interesting purchases, but their sales left something to be desired. So Bartko and Reher decided to rent a store in a top Halle location at a top price. Despite the excessive rent (a whopping 200 deutschmarks net per square meter per month), sales now improved significantly. The model seemed to work. Subsequently, they opened two large stores in Leipzig city centre in 1998. First they acquired an antiques store on the scenic Gottschedstraße, and a gallery on Mädlerpassage followed shortly after. Although their company focused primarily on classic antique objects, the two dealers often came across paper antiques by chance. They were able to buy old books, postcards, images of saints, and photographs from many collectors’ estates. They soon realized that there was a thriving collector’s market for old paper items, and postcards and photographs changed hands the quickest at their store. One day, while Bartko was on holiday, Reher got a call from a dealer friend. He cried on Reher’s shoulder and told him that he was heavily in debt and needed a substantial amount of cash. In the course of their conversation, the dealer offered to sell his stock of postcards. On the spur of the moment, for what was then the sensational sum of 20,000 deutschmarks, Reher bought the dealer’s entire stock, thus laying the foundation for the postcard dealing business. Dealing in postcards quickly proved to be so profitable that both entrepreneurs decided to make it their main focus. Consequently, they wound up all their stores and sold and auctioned off their stock of antiques in order to specialize in postcards from then on. As the operational centre of the “new” company Bartko-Reher, the store in Hansering in Halle/Saale was established as a postcard store. 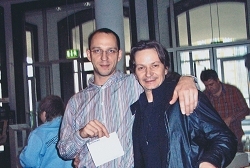 The year 1997 marked the beginning of Bartko-Reher’s reorientation and restructuring. It was a decisive transformation which bore the first traits of today’s company. In order to be able to sell their goods everywhere in Germany, the two entrepreneurs started making frequent business trips. Every weekend, they travelled to a different postcard fair. At that time, major international events took place on a regular basis between Hamburg and Munich as well as in Cologne or Stuttgart. But smaller regional swap meets, such as in Großenhain und Grimma, were also used for sales purposes. However, switching to postcards and ephemera also entailed new work processes. Looking back, this activity involved a completely new work and business model: Cards needed to be sorted according to postcodes or themes. Particularly cards with motifs were so diverse that sorting them required a sure instinct and market knowledge. Yet even seemingly simple things – such as erasing the prices of collector’s stocks that they had purchased, or taking cards out of bags and putting them into bags – were also important. After all, even “old” items had to look good, and postcards required an enormous range of preparatory steps before being ready for sale. It could no longer be managed by just two people. By now, the company had several employees. Alongside a number of student temps, Daniela Teichmann and Daniel Seidel made truly decisive contributions to the company’s growth. They also became outstanding postcard specialists. While Daniela Teichmann still works in our team, Daniel Seidel has become a successful independent trader after ten years with Bartko-Reher. Business was booming, and the company bought an increasing number of smaller postcard dealerships to build up an ever increasing stock. However, sales at trade fairs and swap meets were restricted to regional events. In addition, certain themes and foreign cards were almost impossible to sell at German fairs. So how could one reach even more collectors? The team started looking for a new path. They knew that their stocks had even greater latent potential and it was clear that, if the collectors didn’t come to them, they had to go to the collectors. They took on the idea of a mail order business and developed it into a postcard selection mail order business. This method was nothing new and had already been used successfully by some German postcard dealers. Bartko-Reher’s innovation lay in the methods it used to acquire customers and to optimize its business processes. The company placed small ads in regional newspapers all across Germany. 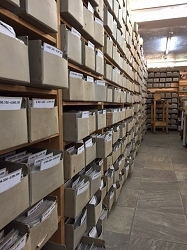 The team called and supplied public institutions such as archives and museums, as well as “Heimatvereine” (local heritage associations) and dealers. Step by step, the system developed into a sure-fire success. At its peak, the mail order database included more than 12,000 active customer addresses. In 2003, the company achieved seven-figure annual sales for the first time. 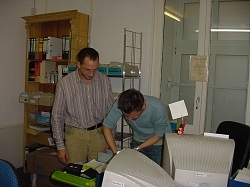 Bartko-Reher started using the Internet as an additional sales channel in 1999. At that time, no one in the company had any idea of the endless possibilities offered by the new medium. At first, it achieved sales in the low thousands every month. Goods were sold via Alando, then later via eBay or Ricardo and various other trading platforms. This changed when Marco Hebenstreit joined the Bartko-Reher team. Marco was the first to recognize the Internet’s enormous potential. But the decisive factor was that he was a qualified computer programmer with a tremendous flair for all things technical. Having their own in-house Internet expert at the company gave Bartko-Reher a massive advantage over their competitors in terms of know-how. Marco Hebenstreit understood at an early stage that Bartko-Reher needed to set up its own Internet platform in order to be able to operate independently of external Internet providers. He programmed our first online shop which was tailor-made for our target group of postcard collectors. Thus, in the year 2000, www.ansichtskartenversand.com was born! This step was extremely important, as the placement fees for eBay’s online auctions were very high at that time. If, like Bartko-Reher, you wanted to place a vast number of postcards for auction, your fees would have exceeded your profits. In addition, the generally prevailing auction format at that time was incompatible with Bartko-Reher’s basic principle. We wanted to sell large quantities of postcards at clear and fixed prices. 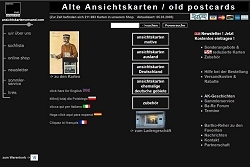 The customer should be able to make purchases at www.ansichtskartenversand.com straight away, without any waiting time, and for a low price. Even in those days, the goods were dispatched immediately on the date of payment. We still follow this principle faithfully today. This service was gratefully accepted by many delighted customers. The online shop www.ansichtskartenversand.com grew rapidly. In 2003, we were able to offer 100,000 postcards and ephemera online. In 2009, we offered no fewer than 500,000 postcards. In 2012, the figure was 1,000,000 postcards and ephemera. Today, we offer more than 1.5 million items in our online shop. Today, the company Bartko-Reher OHG is based at Linienstrasse 156 in the centre of Berlin. This happened simply because the premises in Halle/Saale were no longer big enough. By now, Bartko-Reher had eight employees. A move became increasingly necessary. Then we had the idea of moving the entire company to Berlin. Almost all the employees decided to go with the company. But why Berlin, of all places? The year was 2003, and the German capital was trendy as never before as the ideal place to live. People from all over the world shaped Berlin's flair. Creative impulses and new ideas in the Internet sector increasingly came from the capital. In addition, Berlin had a diverse antiques scene. 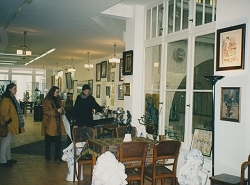 The company founders discovered their ideal location in the historic antiques district around the Winterfeldtplatz. This was where the company opened its first Berlin business premises. However, these soon became too small to accommodate the company’s continued rapid growth. As early as 2006, the company opened a new store on Linienstraße in Berlin’s historic centre. In 2013, it started renting additional workspace. By now, 18 permanent employees and 23 student temps worked for the company and the database included 157,000 paying customers from all over the world. It is often claimed that stamp and postcard collectors are a dying breed. Our sales figures prove that the exact opposite is true. A bond with one’s homeland, historical awareness, and a passion for collecting are constants that span generations. So in order to continue to meet our customers’ needs in the future, we – that is, the entire team at www.ansichtskartenversand.com – work tirelessly and passionately to convert new ideas into reality. Weil Sie der wichtigste Teil unserer Erfolgsgeschichte sind, haben wir dazu insgesamt 10 Bartko-Reher Sammelkarten erstellt und diese im Zeitraum Oktober 2018 bis Januar 2019 an unsere treuen Kunden zum Sammeln verschickt. Damit verbunden haben wir eine kleine Rabattaktion, die jetzt schon beendet ist. Aufgrund der großen Nachfrage haben wir für Sie noch einmal eine kleine Auflage dieser 10 Sammelkarten anfertigen lassen. Gerne können Sie diese Sammelkarten von uns erhalten. Schreiben Sie uns einfach eine kurze Email an info@ansichtskartenversand.com.